Lightning and thunder happen simultaneously, but lightning travels near the speed of light while thunder moves at the speed of sound, approximately 866,000 times slower than the speed of light, which explains the delay between the two phenomena. 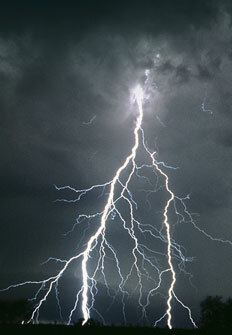 The discharge of a lightning bolt can reach 30 million volts–the equivalent of 2.5 million car batteries! Every second between the time a lightning bolt strikes the ground and the time we hear the thunder corresponds to 300 metres. So, if we count 3 seconds, the lightning struck 900 metres away. Lightning is basically static electricity caused by huge concentrations of raindrops rubbing against each other high up in the sky. There are actually fish species–certain types of rays, eels and catfish–which have special organs that emit electrical discharges. They use these discharges to paralyze prey, defend themselves or locate objects. Electric eels (Electrophorus electricus), which live in South American rivers, produce enough electricity to power a dozen 40-watt lightbulbs. The sun's activity intensifies every 11 years, creating storms on the surface of our star which, in turn, disrupt the Earth's magnetic field. These magnetic storms have the potential to cause serious problems for power transmission systems. Solar cycles are a relatively unknown and complex phenomenon. However, scientists have observed that the number of sunspots appearing on the sun's surface reaches its maximum every 11 years. These dark spots have been under observation for nearly 400 years, since the invention of the telescope, and are the source of solar flares in which huge amounts of energy are suddenly released. The strongest are as powerful as 40 billion atomic bombs! This energy heats the surrounding gases, ejecting huge bubbles of ultrahot matter from the Sun. These masses of protons and electrons, known as plasma plumes, can eventually hit the Earth. The flow of gas and particles released by the Sun travels at an incredible speed of 300 to 1,200 km/s! Even at that, it will take a few days for this solar wind to travel the 150 million kilometres separating the Sun and the Earth. We already know that photons reach the Earth in eight minutes. Charged particles move more slowly and take two to five days to reach us. Luckily, the magnetic field diverts most of them. Those that do penetrate into the atmosphere generate powerful electric currents that move and vary in intensity. These electric currents can travel at an altitude of about one hundred kilometres (the ionosphere) for a few minutes, a few hours and even a few days. The result is the beautiful phenomenon we know as the Northern lights or Aurora Borealis in the Northern hemisphere and the Southern lights or Aurora Australis in the Southern hemisphere. Polar auroras are stellar bursts of intense color and captivating beauty: one of Mother Nature's most spectacular performances. 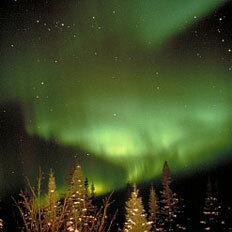 Unfortunately, these bright and colorful shows are not the only effects of solar wind. The electric currents in the ionosphere cause rapid variation in the intensity of the Earth's magnetic field and trigger what is known as magnetic storms. They also induce currents in the Earth's crust, and these currents try to flow through anything that is a good conductor such as railroad tracks, pipelines, submarine cables and power lines. The lines of a power transmission system are connected to the earth through transformers, which provide a path of least resistance, so the current produced by magnetic storms travels through them. But because transformers are not made to withstand this type of current, distortions of the electric waveform are produced. The protection system perceives this abnormal wave as an overload or voltage surge and "trips open" or deactivates some of the transmission equipment. The result is an interruption in transmission and possibly a power outage. Magnetic storms affect much more than just power transmission lines. They can disrupt satellites, radio communications, cellular phones, VHF television broadcasts and short-wave communications. They can also corrode natural gas and oil pipelines. Railway crossing lights have even been seen activating themselves!